Most likely you will use the SpeedGrader to enter grades. The grades will appear in the Gradebook when you are done. However, you can manually enter and edit scores in the Gradebook. You can also use a CSV file to upload and download scores. The Gradebook is generally designed for one instructor role to enter grades at a time. Because of how the Gradebook loads and stores data in the browser, multiple users should not grade assignments at the same time since each grader cannot view the most recent information for a submission. For more details on grading limitations, please see the lesson about how to use SpeedGrader. Once a student receives a grade for an assignment, the grade will always apply to the student's current and final score. If you unassign a student or section to a differentiated assignment you have previously graded, the grade will only be removed from grading calculations if you excuse the assignment for the student. Click the assignment cell located in the row of the student whose score you want to enter. Scores are entered according to the assignment's Display Grade setting. Scores can be entered as one of five options: points, complete/incomplete, letter grade, percentage, and GPA. To enter a points grade, enter the number of points in the cell and press Return (on a MAC keyboard) or Enter (on a PC keyboard). To enter a complete or incomplete grade, double click in the cell until the desired icon appears. Complete grades are represented by a checkmark. 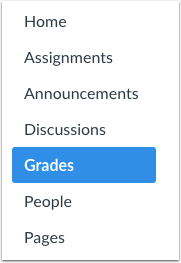 Incomplete grades are represented by an X icon. To enter a letter grade, enter the letter in the cell and press Return (on a MAC keyboard) or Enter (on a PC keyboard). Canvas automatically calculates the number of points corresponding to the highest value in the range represented by the letter grade. To enter a percentage grade, enter the percent in the cell and press Return (on a MAC keyboard) or Enter (on a PC keyboard). To enter a GPA grade, enter the number which corresponds to the GPA scale defined by the grading scheme and press Return (on a MAC keyboard) or Enter (on a PC keyboard). To edit an existing score in the Gradebook, click the assignment cell for the score and enter the new score. Then press Return (on a MAC keyboard) or Enter (on a PC keyboard). To manually delete a score from the Gradebook, click the assignment cell for the score and click the delete key. Then press Return (on a MAC keyboard) or Enter (on a PC keyboard). View the deleted score and the ungraded submission. Previous Topic:How do I hide student names in the Gradebook? Next Topic:How do I excuse an assignment for a student in the Gradebook? Table of Contents > Grades > How do I enter and edit grades in the Gradebook?